For five years, I commuted to Chicago for work. I left the house at 6:30 to make it to work by 8:30. At 4:3o, I left my office and power walked to the train. At 4:47, my train left the platform. By 5:00, I was sound asleep until my train pulled into the University Park station at 5:40. I quit that job in August 2008. It's been nine months, yet I still know the schedule. At 6:30 a.m., I start to feel nervous, like I'm late for something or I forgot to do something. And at 5:00 p.m., I can hardly keep my eyes open. I wonder how long it will take to get that commute out of my system. As of May 9, I finally have my master's degree! 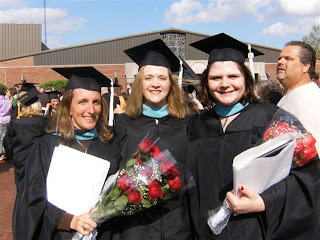 As I was coming home from dinner that night, it actually hit me that I had my MASTER'S degree, which I swore I would never do because I was tired of school. I'm very impressed with myself. But no more! I swear, I won't get a doctorate! For those who are curious, pictured at the left are two of three gals in my "cohort", which is basically a small group of students who would meet every week to complete group assignments. On the left is Rhonda, and in the middle is Heidi.